Rooms at the Each Room at the Ringling House offers a different glimpse into the life and experiences of the Ringling family and circus culture. This room is dedicated to Charles and Edith Ringling, the couple who built this grand home in 1901. This room was Edith’s sitting room. It features a king size canopy bed, large windows, built-in fireplace with electric insert, air conditioning, and private attached bath with walk in shower, marble sink, and heated bath fan. This room is 238 sq ft without the bathroom, and has an adjoining door to the Sally & Richard Room. You can read more about Charles & Edith Ringling at Sarasota History & Biography. We visited for 2 nights for our anniversary. We had a great time at Ringling House. It is a beautiful house with a very interesting history. The rooms are cozy and we had wine and cheese at night and a yummy breakfast in the morning. The bed and breakfast owners are friendly and hospitality was great! There are also many good places to eat and visit nearby. Great location and a good romantic getaway. This room features a queen sized bed, large windows, standard electric fireplace, a private attached bathroom with original tile work and marble sink, a tub with overhead & handheld shower, heated bathroom fan. This room is 239 sq ft without the bathroom, and has an adjoining door to the Emmett & Eva Room. 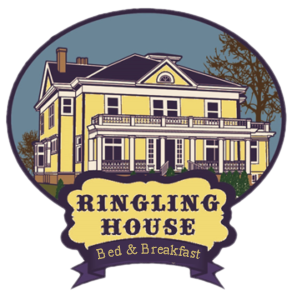 We had an amazing experience with Stu & Julie, at The Ringling House B&B! They were amazing hosts, & had great suggestions on were to go & places to eat. We will definitely stay at your B&B again! Thank you! This room is dedicated to the true love and tumultuous romance of Lillian Leitzel and Alfredo Codona, who were performers in the Ringling Brothers Circus during the years of 1917 -1931. It features a private attached bath, tub with overhead & handheld shower, heated bathroom fan, mini fireplace/air conditioning, queen size bed and matching dresser/commode, large windows, large double closet. This room is 180 sq ft without the bathroom. Learn more about the history of Lillian and Alfredo. Just enough history – Unlike many B&Bs in 19th century houses, this one has been updated where it counts. The main floor retains the feel of the original, while the bedrooms have updated linens and bathrooms, individually controlled heat/air, and digital TVs. The hosts serve a generous breakfast in a single seating, the time of which is decided the day before. They are also very knowledgeable about the history of both the house and the city. This room is dedicated to Henry and Ida Ringling. Henry was the second Ringling brother to own this beautiful home, and who’s family owned it for nearly 100 years. It features a full size bed, large windows, blackout curtains, blinds, attached private bath with walk in shower, heated bathroom fan and is 164 sq ft excluding the bathroom. This room has an adjoining door to the Emmett & Eva Room. Definitely a lovely place to stay, exceeded our expectations. Close to downtown location as we were able to walk there every eve for dinner and entertainment. This room is dedicated to the romance of Emmett Kelly and Eva Moore, who performed their own double trapeze act with the Ringling Brothers circus from 1923-1924. This room features a queen size bed, large windows, deep bath with a jetted tub & shower, heated bath fan, mini-fireplace/air conditioning. This room is 157 sq ft without the bathroom, and has an adjoining door to the Ella and Fred Room, and the Henry & Ida Room. This room is dedicated to Sally & Richard Clayton-Jones, whose family was the last of the Ringling’s descendants to own this spectacular household. It was Salome Ringlings’ (Sally Clayton-Jones) bedroom when she lived here. It features an antique queen size brass bed, his & her closets, a private attached bathroom with original tile work and a marble sink, bathtub with handheld and overhead shower heads, heated bathroom fan, mini fireplace/air conditioning. This room is 186 sq ft without the bathroom, and has an adjoining door to the Charles & Edith Room. Fabulous B&B in easy walking distance to the town square and the Circus World Museum. Room and bath were spacious and comfortable. The décor takes you back in time but with modern conveniences. The bed and pillows were so comfy that my wife and I both slept an hour and half longer than we usually do. Room was very quiet even though the main road in town passes right in front of the house. Exploring the downstairs rooms was fun and wish I had more time to just sit and read and enjoy the surroundings. Love porches and the Ringling House didn’t disappoint. Again, wish I had more time, and a bit warmer weather to enjoy it more. Can’t say enough about our experience other than wouldn’t think twice about saying there again.